1. Preheat the oven to 220°C, gas mark 7. Roll out the two dough balls on a lightly floured surface to make 25cm pizzas, then transfer each pizza base to an oiled baking sheet. Divide the tomato purée between the two bases. 2. 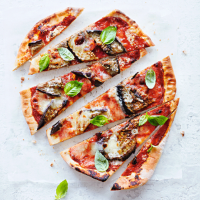 Cut the aubergine into 2cm wide strips and divide between the pizzas. Tear the mozzarella into pieces and scatter onto the pizzas, followed by the parmesan. 3. Bake the pizzas for 20 minutes or until golden and bubbling. Finish each pizza with a light drizzle of oil and a scattering of torn basil leaves.